The link goes to a post from 2004 about GRIMJACK. I’m going to assume that you’re linking to the Buffy fake stake prop? Or have all these years reading Mike’s Musings been wasted? 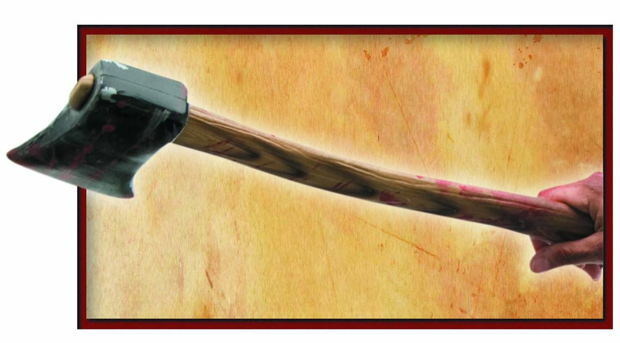 …couldn’t you just buy a real axe? Tim – When I cut ‘n’ pasted the link from the post, it worked fine. When I clicked on the link, it went to the GrimJack post. Apparently leaving the “http://” out of the link screwed it up. It works now! The cheapest axe or hatched I could find at Home Depot.com was about 25 bucks. This seems like a good deal. Previews, for all your home improvement needs! Also a tie in to Lizzie Borden fans!